Eco-friendly gardening practices are those that do not cause harm to the environment. There are many benefits to eco-friendly gardening practices -- from improved water quality to improved wildlife habitat to creating a safer environment for children to play in -- but using them to create an attractive, healthy garden takes a bit of patience and understanding. Exactly what an eco-friendly garden looks like depends on both the regional context of where you live and your personal interests and desires in having a garden. However, most eco-friendly gardens will include components like soil, plant choice, hardscape, design, and maintenance. Healthy topsoil is the key to a healthy garden. Rather than using synthetic fertilizers to promote plant growth, eco-friendly gardens rely on adding organic matter to the soil in the form of compost and mulch, as well as using all-natural fertilizers when needed. A great way to get started with an eco-friendly garden is to spread 2 or 3 inches of compost over the entire garden area and till it in prior to planting. This will create a base of soil fertility for many years to come. Maintaining a 2 to 3 inch layer of mulch on top of the soil at all times ensures that more organic matter is constantly added to the soil to offset any that is lost as plants are harvested or removed. 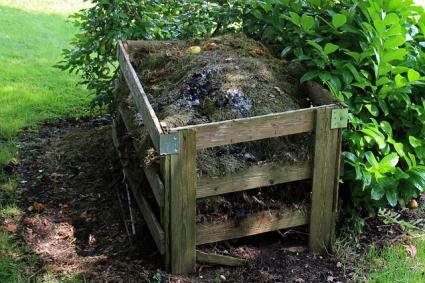 The continual process of decomposition that occurs in the mulch layer feeds the microorganisms that are responsible for soil fertility, reducing the need to use concentrated fertilizers, which have a host of negative environmental impacts. 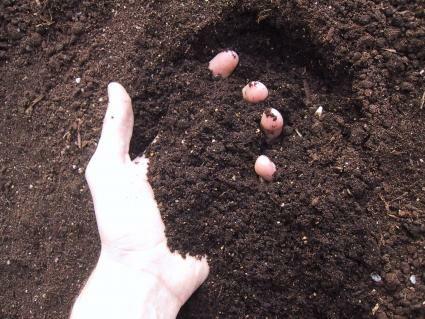 The source of compost and mulch is an important consideration. Try to find the most local possible sources to cut down on the environmental impacts of transportation associated with it. If possible, use compost and mulch that is free of pesticide residue. In the case of manure-based compost, seek out sources that do not originate from animals that are fed hormones and antibiotics. Local organic dairy or poultry farms are a good source for eco-friendly compost while local tree service companies may be a good source for mulch. There are several things to consider when selecting plants for an eco-friendly garden. The top priority is to use native species from your region. These will be well-adapted to local growing conditions, meaning they will need fewer resources to maintain (water, fertilizer, etc.). 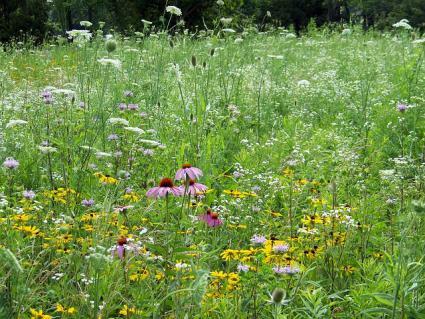 Native plants also provide habitat for native birds, insects, and other wildlife, creating a garden that approximates the value of a natural system as habitat. However, a large selection of native plants is not always available in all areas -- or you may wish to use non-native species for their aesthetic qualities -- but there are many other plants that can help you create an eco-friendly garden. Focus on tough, resilient drought tolerant species with wildlife value. For example, dense evergreen shrubs, whether native or not, make good nesting sites for many birds and berry-producing shrubs provide a food source for many types of wildlife. 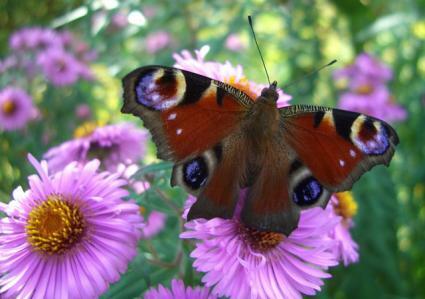 Planting a wide selection of flowers for a continuous bloom through the seasons ensures that there is always nectar available for native pollinators. Above all, avoid planting invasive species, as these may spread into nearby natural areas and displace native plants. Food gardens, if they are maintained with organic practices, can also be a component in an eco-friendly garden. Producing fresh food at home is part of a green lifestyle, so it makes sense to devote a sunny portion of the landscape to this purpose. If you want to build a deck, look for a source of lumber that is certified by the Forest Stewardship Council (FSC) or use recycled composite decking. Instead of quarried stone for paths, patios and retaining walls, use broken concrete salvaged from construction sites, also known as urbanite. Avoid pressure treated wood, railroad ties (which are soaked in creosote), and other hardscape materials that involve toxic substances. In terms of design, keep in mind that the most environmentally-friendly landscapes do not have a traditional, manicured look. In keeping with the idea of mimicking a natural ecosystem, it's fine to allow them to be a little overgrown and disorderly -- nature rarely occurs in straight lines or looks as neat and clean as the average front yard. Dense shrubbery, piles of brush, rock outcroppings and other quasi-natural features can all be part of the overall design. It may take an adjustment of your expectations, but eco-friendly landscapes have a different form of beauty, one that is much more akin to natural landscapes. Once you have the garden installed, get to know the most eco-friendly techniques to care for it over time. Other than food plants, eco-friendly gardens emphasize drought tolerant species, so there is less need for irrigation compared to conventional landscapes. However, even the most drought-tolerant species need water for the first couple of years until they get established. Instead of sprinklers, drip irrigation systems are a much better choice as they provide water in the most efficient way possible. If you do use a sprinkler, avoid watering in the middle of the day when evaporation is highest or during windy weather. Though an eco-friendly garden should have minimal fertilizer requirements, at times you may want to give a boost to certain plants with an application of organic fertilizer -- this is especially important for food plants. Most garden centers carry a large selection of organic fertilizer products, including bone meal to add phosphorus, blood meal and fish emulsion for nitrogen, and products like kelp and greensand that add micronutrients. Rather than reaching for insecticides and fungicides, consider natural alternatives when pests and disease strike. Horticultural oil, insecticidal soaps, and other biological products are available as alternatives. 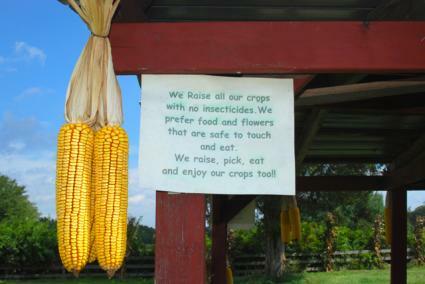 It's also possible to release beneficial insects that prey on common garden pests. However, pests and disease tend to be minimal in eco-friendly gardens because of the emphasis on soil fertility and using tough, well-adapted plants. 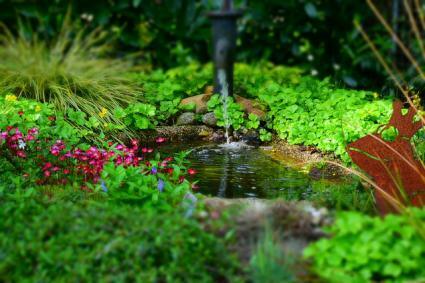 One sign of an eco-friendly garden is that it does not require the regular use of gas-powered machinery to maintain it. Traditional lawns and sheared hedges are not part of the picture and organic debris should be allowed to accumulate on the ground where it will enrich the soil and provide habitat for insects. In other words, eco-friendly gardens are inherently low maintenance gardens. However, if you do decide to cut things back from time to time for the sake of aesthetics of safety, try to use hand-operated or electric-powered tools as mush as possible. Planting densely and allowing the plantings to grow into a continual groundcover reduces the opportunity for weeds to get established, but if they do, consider non-toxic methods to control them such as vinegar weed killer, or use weed fabric to suppress them. At every step of the way in designing and implementing your eco-friendly garden, make choices that reduce wastefulness and create an environment that functions as much like a natural ecosystem as possible. Birds, bees, and other critters will benefit and you can share in enjoying their natural sanctuary.